In response to a great suggestion from one of Barbara’s “dear readers,” we’ve been inspired to post a little something about the room where she did her writing, in her beloved “MPM Manor” out in the Maryland countryside. She bought the old farmhouse from an interior designer, so it had already been decked out and updated in style. The study area already had a beautifully draped fabric hung from the ceiling; when it came time to replace that, MPM decided to have fun and “go golden.” Her house contained large collections of all kinds of books — mysteries, science fiction, historical novels, children’s books, classic literature (Jane Austen! ), melodramatic old accounts of desert romances, you name it. In the study she kept a collection of her own books — one copy of each edition, including those in many different languages and the audio book versions. She also surrounded herself with books and journals pertaining to her central interests — Ancient Egypt, and the histories surrounding the exploration and development of archaeology there …. It was less than a month before she died when Barbara put down her pen, announcing that she would not be writing any more. This caught many of us by surprise, much as we’d known the day would have to come. But despite many attempts to “retire” in previous years, she’d always found herself bored, restless, at sea when she stopped writing – and eventually relented to write (usually) “one more” Amelia. As it had been since she was a very young woman, writing remained her solace, the goal toward which so many of her days were bent. Through even the worst of days, it was the imaginative lens through which she loved to think about the world — and the magic that she sought to share with her readers. What a gift. 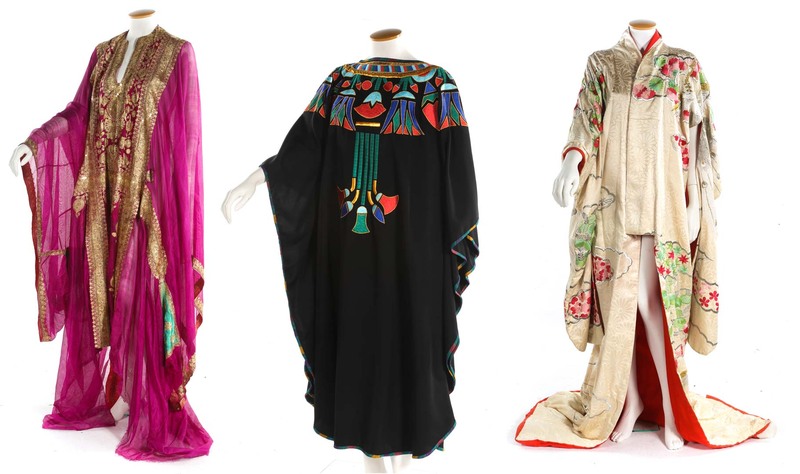 Everything from English Women’s Clothing to Bloomingdale’s Illustrated 1886 Catalog! … and one tiny sample from the many shelves of books on Egypt…. We note that one of the parasols is a bit cracked at the end — perhaps due to the kind of vigorous prodding for which Amelia was infamous??? Knowing Barbara, this seems quite possible! 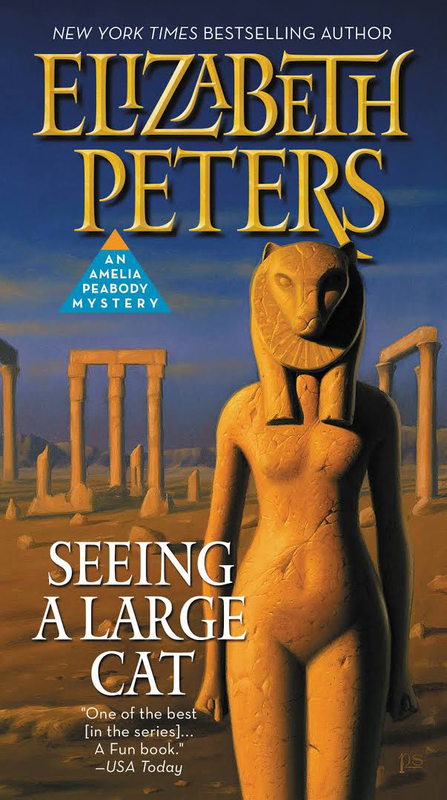 NOTE TO SALIMA IKRAM: Mike attached himself to the Keeper of Egyptian Antiquities because of the care which that official bestowed on the mummies of Egyptian cats. Mike also eventually developed the habit of chasing dogs out of the Courtyard of the Museum — The dogs that laughed at policemen and gatekeepers fled in terror before the attack of Mike, who, swelling himself to twice his normal size, hurled himself on them. As Mike aged, he received the royal treatment: He preferred sole to whiting, and whiting to haddock, and sardines to herrings; for cod he had no use whatever. In what Budge describes as “the most excellent Memorial Poem on Mike,” F.C.W. Hiley, M.A., Assistant Keeper in the Department of Printed Books, details Mike’s disdain for pats or handling by most people: And if perchance some forward minx/ Dared to go up and stroke the Sphinx — / Her hand shot back, all marked with scores / From the offended Michael’s claws ….BUT he laid aside his anti-human grudge for Budge: Each morn Sir Ernest, without qualms / Would take up Michael in his arms. Now the pamphlet does tell us that Mike especially disliked the pokings in his ribs which ladies bestowed upon him with their parasols — but then Amelia would totally know better than to treat a cat that way. So, would this have softened Amelia? (realizing that nothing would have softened Emerson!) …. well, knowing how she felt about the smuggling of antiquities, and her dire suspicions of Budge — it’s hard to say! How many people really fit on a dahabeeyah? 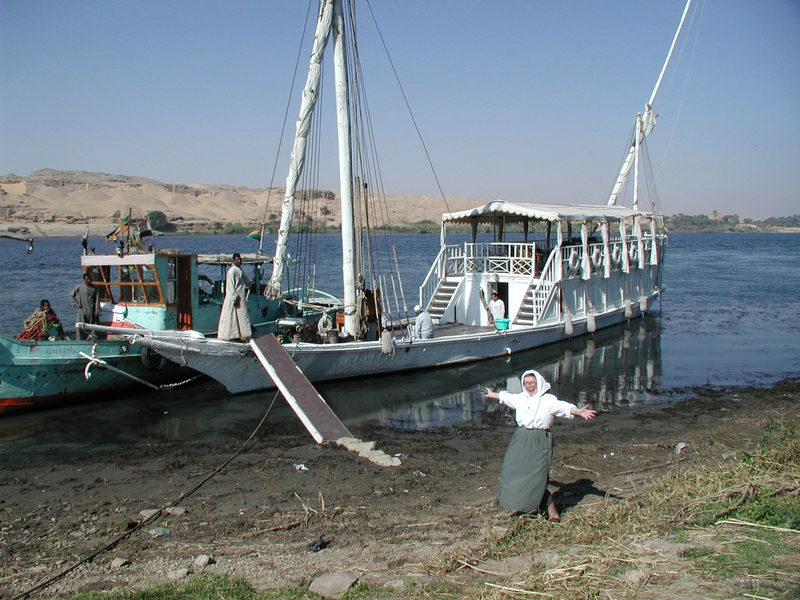 …speaking of ON THE NILE, IN STYLE, readers may remember that Amelia’s favorite way of traveling the Nile was … in a dahabeeyah (or, if you prefer, a dahabeah, dahabiah, dahabiya, dahabiyah, dhahabiyya, dahabiyeh or dahabieh) …. 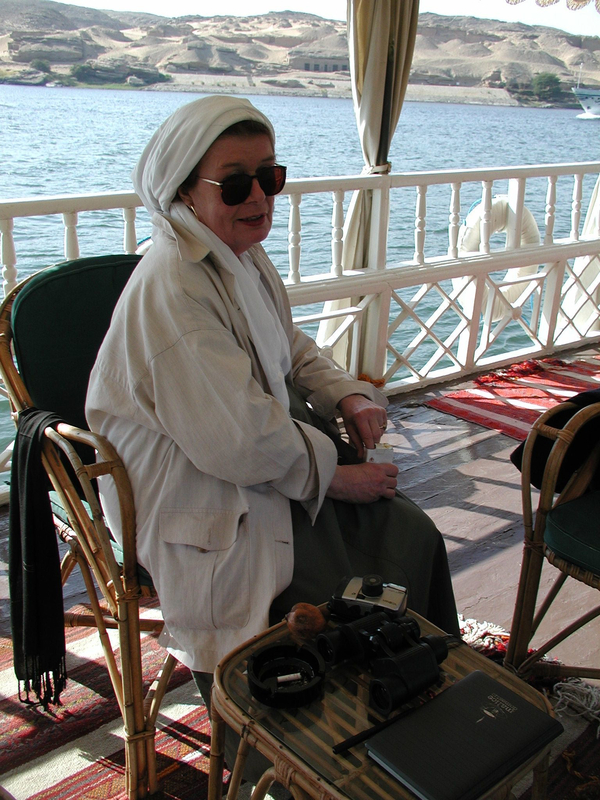 The attached pictures show Barbara enjoying a dahabeeyah trip in 2003 (thanks to Ray Johnson!) 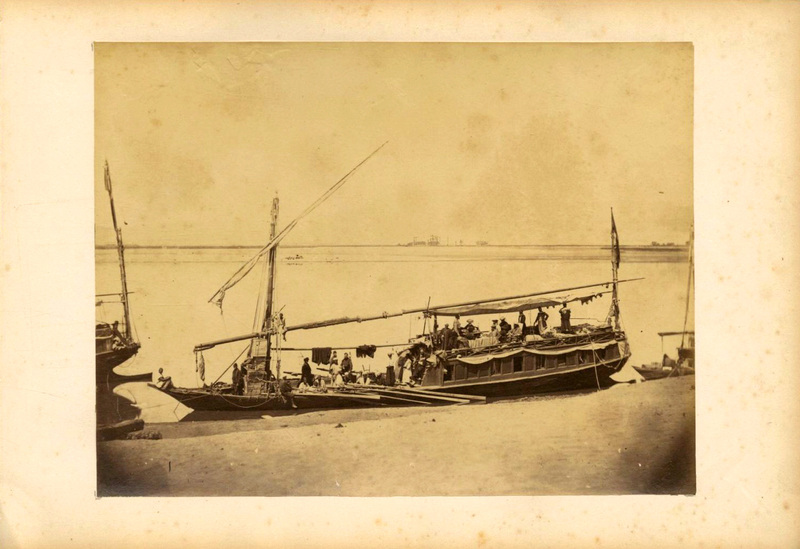 — along with an antique photograph of a dahabeeyah courtesy of William Joy and his mother, from their extensive collection. 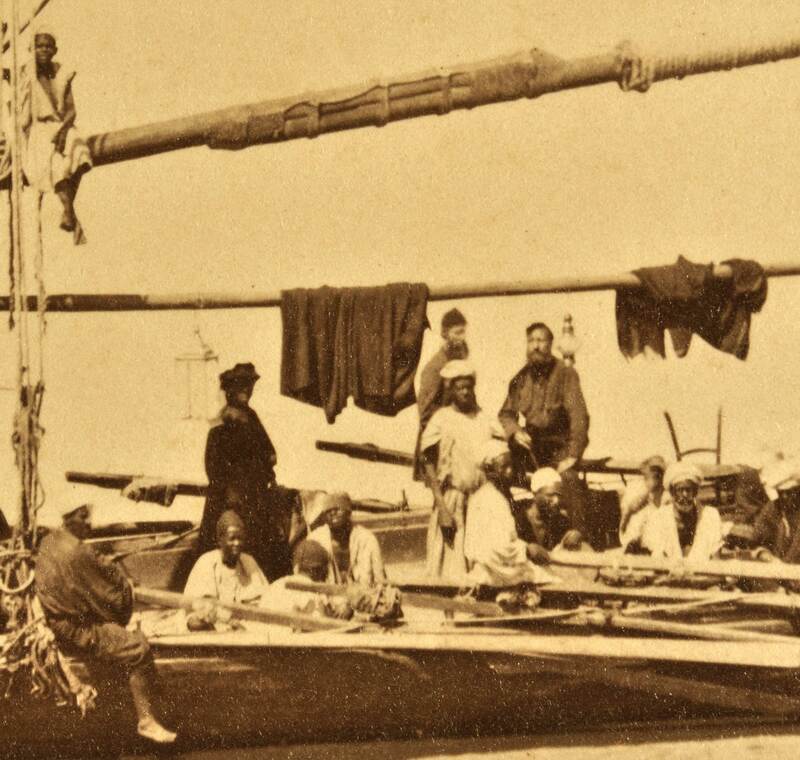 William reports that the photo was made on the Nile, around 1875 — and that several Egyptologists looking at it have wondered whether a shadowy woman who appears in the picture might be Amelia Edwards (the daring woman after whom Amelia Peabody was named)….. Could that be a parasol in her hand…..?? ?